Under Armour, an American, publicly-listed sports clothing and accessories company that generates a couple of billions of dollars in sales annually, raised eyebrows earlier this year when it made a swift move into the ‘connected fitness’ app space by buying MyFitnessPal and Endomondo simultaneously. The latter was a company started in Copenhagen by a trio of ex-management consultants in 2007, with ‘making fitness fun’ as its mission. With a fitness tracking app and website / social network, Endomondo attracted 20 million users, before getting acquired by Under Armour last February for $85 million. Last August, Austria-based competitor Runtastic was also acquired, by Adidas for €220 million. More consolidation is likely ahead, and it seems like European startups are on the radar in this particular vertical. 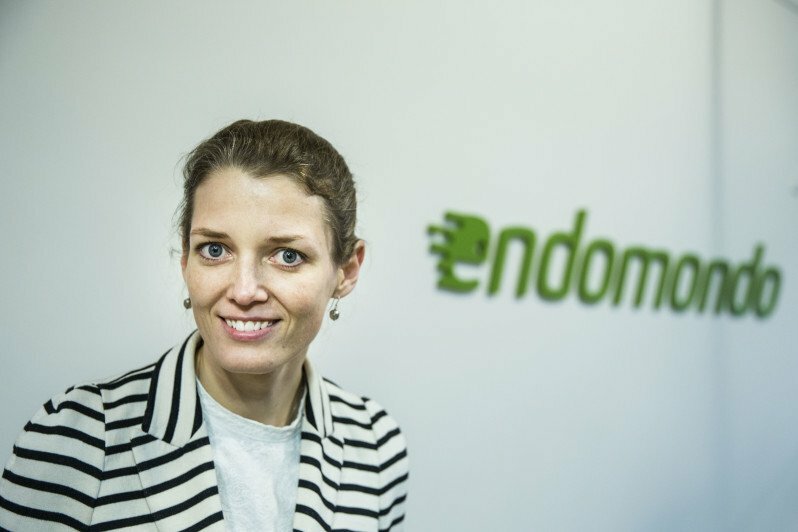 Reasons enough for us to catch up with Mette Lykke, who co-founded and led Endomondo as CEO, to talk about the space and what’s going on at the company post-acquisition. After the acquisition, you got a new role as VP of International Digital at Under Armour. How long are you stuck with them? (Laughs) I’m not stuck, I have my free will. I’m not the type of person that likes to be stuck. I’m enjoying myself and I still really have a lot of passion for our original vision, which is luckily shared by Under Armour as well. How big is your new owner? We have about 11,500 employees and will do close to $4 billion in sales this year – it’s a pretty big company. Are most of these employees working in the United States? Yes. Under Armour is the second largest sports brand in the US and I think about 90% of our revenue is coming from the US. Internationally they’re we’re still just getting started, which was actually part of the reasoning behind the acquisition of Endomondo. Does that mean you didn’t move to the US either? No, I’m still in Copenhagen, and so is the rest of the team – no plans to change that. How many staff was there at Endomondo at the time of the acquisition, and now? I’d say about 40 at the time the deal was announced, and about 52 currently. What about users? If the reports are accurate, you had about 20 million people using Endomondo at the time of the acquisition – how about today? Well, the number is still going up (laughs). Our growth rate has been pretty consistent before and after the acquisition, in fact – we keep growing at a pretty steady pace. In total – taking into account that we’re now part of Under Armour’s ‘Connected Fitness’ group – we’re seeing about 100,000 new registered users per day. That’s pretty solid growth. No regrets about the acquisition? Not even when you saw that one of your competitors, Austrian startup Runtastic, was acquired by Adidas for nearly 3 times as much you sold for? No. I mean, they had more users, right? If you look at the price for user, I think it came in even slightly lower, but it was definitely well-deserved for them. Speaking of Runtastic, they’ve recently announced their expansion into physical, wearable devices. Do you have any similar plans? There’s been an announcement recently about a partnership in this field with HTC but I invite you to read up on that online – I don’t have anything specific to add to that. Did the rest of the Endomondo management team stay on after the acquisition as well? Not long after the deal was announced, I read an article about one of the co-founders of the company lamenting the purchase. What happened there? To be clear, he left a few years before the acquisition. He was a ‘sleeping investor’ when that happened, a small shareholder, and he got a decent pay-out from the deal. Why was he so unhappy then? I don’t know – you’d have to ask him. How much funding did you raise after starting Endomondo in 2007? We had some private investors in the beginning, and Danish VC firm SEED Capital came on board early on as well – we ended up doing 4 different rounds with them, though I can’t disclose how much we raised in total. Fair enough. When did Under Armour first come knocking? The first conversations we had started in the fourth quarter of last year, so it’s safe to say talks evolved rather quickly. They also acquired an American company called MyFitnessPal at the same time. Why do you reckon that happened simultaneously and at such speed? So, Under Armour is a very special sports brand, in the sense that its founder and CEO still holds the majority of the company. He has a very compelling, strong vision on connected fitness, and he drives a lot of what’s going on in the company to this day. The proof is in the pudding, hence why the acquisitions of Endomondo but also MyFitnessPal and MapMyFitness all happened within a short timeframe. But part of the reasoning behind buying Endomondo was also for Under Armour to gain an international footprint much faster than would be possible organically. For most international consumers, the first handshake they’ll have with the Under Armour brand is going to be through digital. How did those first conversations happen, and were there other suitors during that period before the deal was sealed? I can’t comment on the specifics of the talks we had – that’s just the nature of these things. But I will say that the fitness and exercise tracking space was set to consolidate eventually, also proven by the fact that the Runtastic acquisition happened in the same year as our own. Endomondo’s acquisition may seem like an overnight success, but in reality you and your team spent many years building the business. Take me back to how the company was started, and what the experience was like in the early years. We founded Endomondo back in 2007 after working at McKinsey & Company – in fact we were three management consultants who started working at the firm on the same day. We never could have imagined that it would take so long just to even get the thing off the ground – it takes a really long time to build something, even in tech. Of course, we’ve had our fair share of ups and downs – I remember mostly the stressful financial situations, when you’re trying to bootstrap your startup while at the same time talking to investors about funding every so often as you scale. Being based in Denmark definitely didn’t do us any favors on that level – it’s not the kind of place where you just go out and raise tens of millions of dollars. The numbers are a lot smaller here. We’ve had our share of financial challenges along the way, before we made it to profitability a while back. That was definitely a big day for us at the time. There were also some technical things we needed to sort out in the beginning, but I guess that’s just part of the journey. Did you ever think to yourself, ‘what am I doing here in Copenhagen’ and made plans to move to a more mature hub like Silicon Valley or London? We actually had an office in San Francisco for a little while, but we found that it was just so insanely expensive, and finding the right people in the Bay Area is really hard and costly – the competition is extremely fierce. At one point we decided to stay in Denmark and simply travel to the US whenever it made sense for us. Speaking of talent, was there enough of it available in Copenhagen for a startup your size? Yes, I think so. I’m sure people would argue that if we’d moved to a more mature tech hub, we might have raised more money in our last round and possibly gotten a higher price for the business. I don’t know, but my feeling is that it all worked out pretty well for us in the end. Are you saying being based in Copenhagen was a barrier to raising more funding, compared to companies located in cities like London or Berlin? I don’t know the other ecosystems well enough to compare, but Copenhagen and Denmark in general are starting to get on the radar more often, it seems. There have been some interesting exits, and there’s a couple of potentially big companies coming out of the scene. I think it’s exciting to see it evolve. Are you getting involved as well, by doing angel investments for example? Not for the time being (laughs). I promised myself not to get involved in anything new this year. But I’m impressed with what’s going on – just look at the #CPHFTW initiative and how many people attend their ‘town hall’ meetings, things are definitely moving. Any thoughts on the wider European startup scene? It’s interesting to think about it; I actually don’t think there’s that much of an ‘ecosystem’ on a pan-European level – at least not one that I’m aware of or feel part of. I don’t have any real insights on that to share. All I know is there are amazing companies coming out of places like London and Berlin, and that countries like Sweden are really punching above their weight in that regard as well. As an entrepreneur with the experience that you have now, what is some of the advice you would pass on to aspiring or beginning startup founders – especially in the context of your recent acquisition? Gosh, what did I learn from the due diligence? That you don’t actually need a lot of sleep (laughs). Our due diligence process may not have been very long, but it was definitely very intense. On the acquisition, I think it’s also important to find a partner that understands and shares your vision. Very few founders start a company without a strong vision. They like to think they make the world a little bit better in their own way – we certainly do in a bid to ‘make fitness fun’. So it’s important to find a partner that is aligned with that vision. Also important to remember that a lot of it is about people. If you’re doing a startup, you’re going to work very closely with people, so you need to make sure there’s a cultural fit when they join. What are you working on right now in terms of product? We’re working on some exciting stuff at the moment! Under Armour’s overall strategy when it comes to digital is to go across four product pillars: exercise, daily activity, nutrition and sleep. MyFitnessPal covers nutrition quite well, while MayMyFitness and Endomondo are all about workout tracking. But we’re working on all of those four product pillars, so expect some announcements on that in the near future.